Just picked this up for cheap. I've never had any kind of thinkpad before, but I thought it would be fun to try and fix one of these up for some windows 98 nostalgia. On the outside it cleaned up pretty well, but there's a bit of rust happening around the outside. The small screws are completely rusted, what size are these? Additionally, there's a bit of rust happening on the rear ports. Finally, the screw for the hard drive bay is completely seized. I've tried coins, flat head screwdrivers, bits of metal filed down to fit it, nothing works. I'm scared to try anything else at risk of damaging other things. Are there any products out there suitable for removing this kind of rust? What about refinishing the ports with some sort of coating afterwards to protect against future rust? I guess the bottom line is: Is this even worth attempting to fix up? Or should I just pass it on as a parts machine? Any advice appreciated, thanks. New AC adapter arrived, plugged it in and the laptop proceeded to boot right up. Unsurprisingly the CMOS battery is dead, and the hard drive makes scary noises. After exiting out of that I restarted and surprisingly, despite the noises the hard drive was making it started to load windows 95, but fails after a few minutes giving some error about waiting for the HDD. 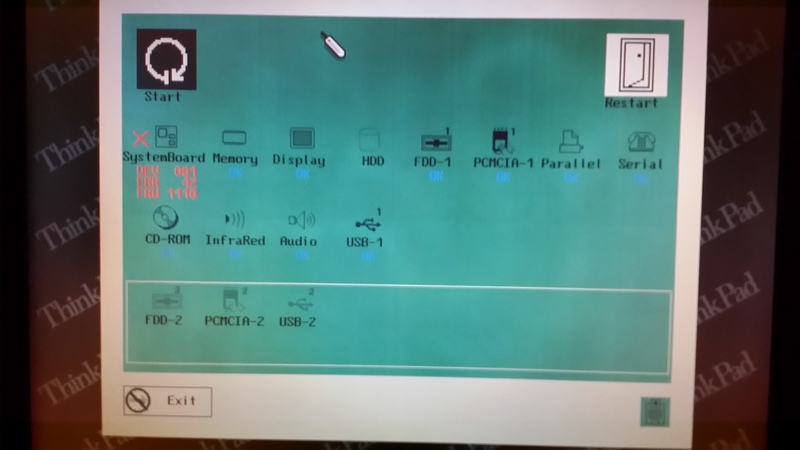 Any idea what the systemboard error is? Keep in mind I still had the dead CMOS battery installed during the test, as I don't have a new one yet. Additionally, I still haven't found a solution to getting the screw that holds on the hard drive bay cover off. I believe you should refer to the hardware maintenance manual for the screw sizes, since they list the screws' dimensions in the disassembly steps. Have you tried sacrificing one of your screwdrivers to remove it? As in, glue the screwdriver's head to the seized screw and unscrew it out? There are, but I am sure that the good old classic baking soda with vinegar should do. Then, rub the affected ports with the mixture on a toothbrush. Refinishing the ports with a rust-resistant coating? I don't think that would be easy to do, since applying a protective zinc coating would need a cold galvanizing spray, or a vat full of molten zinc. I am not very sure about motherboard's error code, because the FRU error code states that the processor daughterboard may be at fault too (11 = processor daughterboard, 10 = motherboard). The motherboard does not seem to have any issues either, based on what you described. If you can tolerate the amount of problems that you have to fix, and you don't mind going through the trouble to make it functional as it once was, I suppose it is worth fixing. In my honest opinion, I would not want to touch any electronic device that has rust on it. Rust alone, tells me that I am putting too much of a gamble on its capability to operate as it should. Using the screwdriver that best fits in the slot, try to tighten it a bit first, then loosen it. Lovely day for a Guinness! (the Real Black Stuff). And pigs CAN fly! Check out The Boardroom for Parts, Mods and Other Services. Small update. I was able to get the HD bay screw out which let me proceed with dismantling the laptop following the directions in the manual Screamer posted. I haven't taken it completely apart yet, but I got most of the main components out, and despite all expectation there's actually barely any sign of corrosion on the inside. Looks good. The only real problem stopping me now is that I discovered a vertical row on keys does not work on the keyboard, 9 O L . in addition to F7 and F8. Maybe something got spilled on it at some point? Are these keyboards repairable at all, or am I out of luck? There's a small chance the keys might just be dirty, or the connection to the motherboard is loose or dirty. Did you already try re-seating the cable? I wonder if it's been submerged in water. I'd buy another one and start over. 380s are plentiful on ebay. So I found a set of supposed restore discs from the archive. Hi everyone, I was wondering if anyone has the tpdemo folder or files for ThinkPads?